§ 219-3 Copies of code on file. § 219-4 Permit for work required. § 219-5 License requirements for installation of systems. § 219-6 Operation of new system. § 219-7 Emptying or cleaning septic tanks. § 219-8 Hearing on denial of license, permit or certificate. § 219-9 Violations and penalties; stop-work order. § 219-11 Fees and charges. Building construction — See Ch. 30. Fees — See Ch. 198. Plumbing — See Ch. 214. A code regulating the location, construction, use, maintenance, and method of emptying or cleaning individual sewage disposal systems, the issuance of permits to locate, construct, empty or clean the systems, and fixing penalties for the violation thereof is hereby adopted pursuant to N.J.S.A. 26:3-69.1 et seq. A copy of the code is annexed to this chapter and made a part of it without inclusion of the text. Editor's Note: Said code is on file in the Township offices. Three copies of the Individual Sewage Disposal System Code of New Jersey (1953) have been placed on file in the offices of the Secretary of the Board of Health and the Township Clerk for the use and examination of the public. No person shall locate, construct or alter any individual sewage disposal system until a permit for the location, construction or alteration of the sewage disposal system has been issued by the Board of Health. The permit shall be valid for one year from date of issuance and may be renewed once and shall be valid for one year from date of renewal upon payment of a renewal fee. Failure of permittee to complete work within one year of renewal shall require permittee to reapply for a new permit and a permit fee shall be due and payable. For each reinspection of an individual sewage disposal system, or part thereof, caused by the failure of the permittee to locate and construct or alter the same in accordance with the terms of the permit issued or the terms of the aforesaid code, a reinspection fee shall be charged. Issuance of permit. The Board of Health may issue a permit if an application is accompanied by a certificate made by an engineer licensed to practice professional engineering in New Jersey stating that the design of the individual sewage disposal system as proposed is in compliance with the code. Required. No person shall engage in the business of installing individual or any other type of sewage disposal systems in the Township unless and until such person has demonstrated a thorough knowledge of the law applicable to installation of individual sewage disposal systems. Examination. The Board of Health or its authorized agent shall conduct examinations designed to test the knowledge and ability of applicants for a license as a certified builder and installer of individual sewage disposal systems in accordance with this code. Examinations shall be held at least once yearly. No person shall be admitted to the examination for a license as a certified individual sewage disposal system installer unless he has met the requirements as set forth on the application and has shown proof of being at least 21 years of age, is a citizen of the United States, and has had at least two years' experience in the business of installing individual sewage disposal systems or the equivalent thereof. Issuance. The Board of Health shall issue an appropriate license to each applicant who has successfully passed the examination for a license to build and install individual sewage disposal systems in Andover Township. Such license shall not be transferable. Licenses held in other towns shall not be accepted in lieu of taking the examination. Renewal. All licenses to build and install individual sewage disposal systems in Andover Township shall expire on the last day of December of each year, and shall be renewed for the ensuing year prior to any work being done during the year. Revocation. The license held by a certified installer of individual sewage disposal systems in Andover Township may be suspended or revoked by the Board of Health or by the Board's authorized agent should the holder of such license be shown to be incompetent in his work or it be proven that the license was obtained through fraudulent means or misrepresentation. Fee. A fee of $10 shall be paid annually by each certified installer of individual sewage disposal systems for a license to operate in the Township of Andover. Certificate required. New individual disposal systems shall not be placed in operation, nor shall new dwellings or buildings or additions thereto be sold or occupied, which must rely on such a system for sewage disposal, until the Board of Health has issued a certificate indicating that the disposal system has been located and constructed in compliance with the terms of the permit issued and the requirements of the aforesaid code. Issuance of such certificate shall not be required for alterations to an existing individual sewage disposal system. Issuance of certificate. The Board of Health may issue such certificate if an engineer licensed to practice professional engineering in New Jersey submits a statement in writing signed by him to the Board of Health that the disposal system has been located and constructed in accordance with the terms of the permit issued and the requirements of the code. License required. Persons shall not engage in the business of emptying or cleaning septic tanks, cesspools, privies or any place used for the reception or storage of human excrement who do not hold licenses to engage in such business issued by the Board of Health. Licenses shall be valid for a period of one year from the date of issuance but may be renewed by the Board of Health. The license may be revoked for failure of the licensee to comply with the provisions of the code or any rule or ordinance of the Board of Health. Permit required. The contents of any septic tank, cesspool, privy or other receptacle containing human excrement shall not be removed until a permit for removal has been obtained from the Board of Health. If a license, permit or certificate required by this chapter is denied by the Board of Health, a hearing shall be held thereon before the Board within 15 days after request is made by the applicant. Upon the hearing, the Board of Health shall affirm, alter or rescind its previous determination and take action accordingly within 15 days after the hearing. The Board of Health may order all further work in and about any individual sewage disposal system, which is being erected or installed in violation of the code, to be stopped forthwith, except such work as shall be necessary to remedy the violation, and thereafter the work continued without any violation of the provisions of the code. After issuance of such order and the service of a copy upon the person connected with or working in and about the erection or installation of the disposal system, or any part thereof, no further work shall be done except as aforesaid. Minimum size disposal beds or fields. For proposed new individual sewage disposal systems, two complete disposal areas shall be provided, each of which shall meet all requirements. An approved effluent diversion device shall be provided between the two disposal areas. The device shall be accessible to adults, but not to children. The disposal areas should be alternated annually to allow rejuvenation of one area while the other area is in use. Where a second disposal area is added to alter an existing system, the old disposal area shall be salvaged, if practical. This may be accomplished by the use of an approved effluent diversion device as described in Subsection A(1) herein, or by other methods acceptable to the administrative authority or its authorized agent. Disposal trenches shall be the preferred type of disposal area. Other types of disposal areas may be used where a trench system would be clearly infeasible. When two or more seepage pits are to be used, they shall have minimum diameters of 10 feet and minimum depths of 10 feet. Seepage pits shall be a minimum of 20 feet apart. A precast concrete distribution box shall be used to distribute the effluent equally to two or more seepage pits. When seepage pits are used, a dual system shall be installed as in Subsection A.
Septic tanks serving single-family dwelling units with four or fewer bedrooms shall have a minimum capacity of 1,500 gallons. Septic tanks serving single-family units with five or more bedrooms shall have an additional capacity of at least 250 gallons per bedroom. All septic systems must have either a single tank with two compartments or two tanks providing the required capacity. The septic tank must be provided with a manhole frame and cover for septic tank access on each compartment and installed at the finished grade of the property. The manhole and frame must be equivalent to Campbell Foundry Pattern No. 1302A and be constructed with a bituminous seal where the casting meets the top of the septic tank. The finished grading must divert surface water away from the manhole cover, which shall be left exposed. There shall be a minimum distance of 100 feet between all water wells and the disposal field. When reviewing plans for a repair or alteration of an existing septic system, the Board of Health or its authorized agent may grant a waiver from the strict application of the requirement as set forth in Subsection C(1) and (2). The granting of this waiver would be based upon the determination by the Board or its authorized agent that, by reason of an extraordinary and exceptional situation uniquely affecting a specific piece of property or the structures lawfully existing thereon, the Board or its authorized agent finds that the strict application of Subsection C(1) and (2) of this section would result in peculiar and exceptional practical difficulties to, or exceptional and undue hardship upon, the owner of such property. Piping. All piping shall conform to the standards set forth in the Individual Sewage Disposal System Code of New Jersey, 1978. Percolation rates. All percolation rates shall conform to the standards set forth in the Individual Sewage Disposal System Code of New Jersey, 1978. Percolation tests shall be performed at the site of each disposal area. A minimum of two percolation tests shall be performed, distributed over the proposed area of the disposal system. Percolation tests shall be performed as described in Subsection F(5). Percolation tests shall not be made in test holes which have been allowed to remain open to the atmosphere for periods over two days or in frozen ground. Tests shall not be made in filled ground unless the soil has been compacted or allowed to settle to the satisfaction of the administrative authority. The percolation test hole shall be placed at the depth of the proposed disposal system. In deep disposal systems, such as seepage pits, the percolation test hole shall be located in each soil stratum. Step 1: A test hole shall be dug to the depth intended in Subsection F(4) with a hand auger or shovel producing a hole having a diameter of 14 inches or 12 inches square. Step 2: Any smeared soil surfaces from the sides of the hole shall be removed to provide as natural a soil interface as practical to infiltrating waters. All loose material on the bottom of the hole shall be removed and a two-inch layer of fine gravel shall be placed in the hole to prevent scouring of the bottom. Step 3: The hole shall be presoaked with clean water to allow to drain. If the soil is known to have a low shrink-swell potential, less than 15% clay content, proceed with Step 4. If the soil has a high shrink-swell potential, a high clay content, then the test hole should be kept wet for a period of 24 hours, prior to proceeding with Step 4. Step 4: Determination of soil suitability. 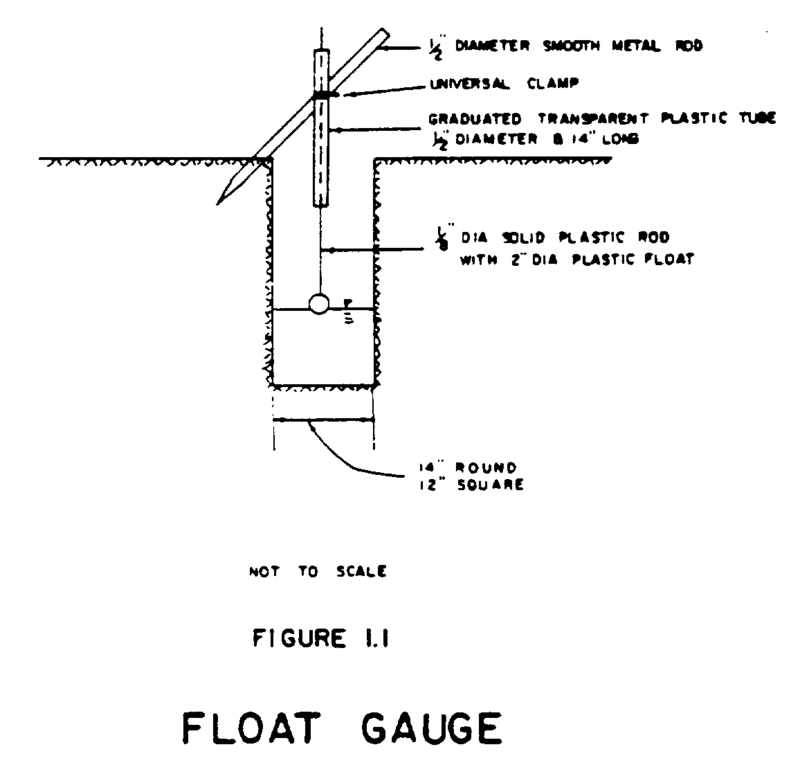 The percolation test hole as prepared in Step 3 shall be equipped with a float gauge, Figure 1.1. The hole shall be filled with clean water to exactly six inches above the bottom of the hole. After a period of 30 minutes, the water level shall be measured. The hole shall be refilled to a depth of six inches above the bottom and the process repeated until four determinations have been made. If the average percolation rate is less than one inch of water in 30 minutes, the soil is unsuitable for ground disposal. Step 5: Determination of percolation rate for design purposes. 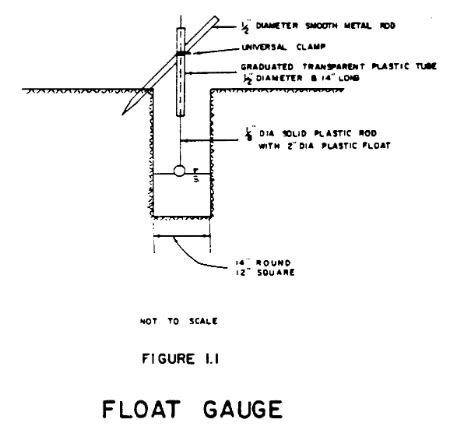 The percolation test hole shall be equipped as prepared in Step 3 with a float gauge, Figure 1.1. The hole shall be filled with clean water to exactly six inches above the bottom of the hole. With the float gauge and timepiece, the time for the water to recede one inch shall be determined. The tester shall refill and repeat the procedure until successive time intervals needed for one inch to be absorbed indicate that a stabilized rate has been obtained. A minimum of two trials shall be recorded. The stabilized percolation rate is recorded in minutes per inch. Reports shall be furnished to the administrative authority indicating the results of each percolation test in minutes per inch, the date of the test, effect of recent rain or lack of rain, the apparent moisture of the soil prior to the test, the depth to groundwater, if encountered, the number of preliminary tests made to determine the suitability of the soil, the type or types of soil encountered, together with the thickness of each layer and all other factors affecting percolation. Subsoil and groundwater determinations. The suitability of the soil mantle for a septic tank depends also upon the geological setting. Information relative to the soil structures and groundwater elevations adjacent to or below the proposed disposal area shall be required. A soil profile of the proposed disposal area shall be determined by excavating a hole with a backhoe as deeply as possible before rock or groundwater is encountered to limit excavation. If a soil profile deeper than the limits of a backhoe is required, a power auger may be used. The depth of the soil profile shall be a minimum depth of 10 feet or to solid rock when encountered within the foregoing depth requirement. The data obtained from this soil profile will be the basis of design of the disposal area. Reports of the type, depth and nature of the soils found, with the soils classified according to the National Comprehensive System of Soil Classifications system and depth to groundwater, shall be made and furnished to the administrative authority. If soils encountered are mottled, indicating seasonal groundwaters, the depth and extent of the mottling shall be noted. The report shall also state the climatic conditions of the six weeks prior to the excavation of the soil log. Where rock is encountered within the depth as required in Subsection F(9), the report shall state its kind and depth encountered. If the rock is the type that is fractured or seamy, the direction of the slope and approximate degree of slope shall also be stated. Where groundwater is encountered within the depth as required in Subsection F(9), the report shall state the depth at which the water was encountered, whether flowing from the bottom of the excavation or from the side in a water-bearing strata. Also the administrative authority may request additional soil profiles at other times of the year if a high groundwater table is suspected, based on vegetative growth and knowledge of the area. The design procedures as described in this section shall pertain to all types of individual disposal methods, leaching fields, seepage pits, leaching trenches. The type of disposal system to be installed shall be determined on the basis of location, topography, soil permeability and groundwater elevation. The system shall consist of a septic tank discharging its effluent to a suitable subsurface disposal area as hereinbefore described, except as it may be modified in accordance with Subsection A. All engineering designs for sewage disposal systems shall consider the limitations for soil absorption systems specified in the latest U.S.D.A. Soil Survey of Sussex County. Where the U.S.D.A. Soil Survey designates the land to be used for sewage disposal as having "severe limitations" for soil absorption systems, the engineer shall provide a detailed justification, satisfactory to the administrative authority or its authorized agent, of how the design compensates for the limiting conditions. The design of the disposal areas shall be performed by a professional engineer licensed to practice in the state of New Jersey. All plans, test data and any other information requirements shall be certified and sealed by the professional engineer designing the system. Existing contours at ten-foot intervals covering an area 100 feet beyond the limits of any component part of the disposal system. All wooded areas on the property. The location of wells on adjoining property. The location of septic systems on adjoining property. All storm drains as to size, type and location. Existing structures and structures on adjoining property. Location and description of benchmark to check disposal and building installations. Proposed contours at ten-foot intervals. Proposed house location with first-floor elevations. Location of retaining walls or terraces. Location of all component parts of the sewage disposal system. Design criteria. The design of the disposal areas shall be based on the following: percolation tests shall be performed under the supervision of the engineer, or his duly appointed representative, according to Subsection F.
The following fees and charges are herewith established. Locate and construct an individual sewage disposal system: as set forth in Chapter 198, Fees. Renewal of individual sewage disposal system: as set forth in Chapter 198, Fees. Reapplication to locate and construct individual sewage disposal system: as set forth in Chapter 198, Fees. Alter an existing individual sewage disposal system: as set forth in Chapter 198, Fees. Renewal to alter an existing individual sewage disposal system: as set forth in Chapter 198, Fees. Reapplication to alter an existing individual sewage disposal system: as set forth in Chapter 198, Fees. Reinspection of an individual sewage disposal system: as set forth in Chapter 198, Fees.